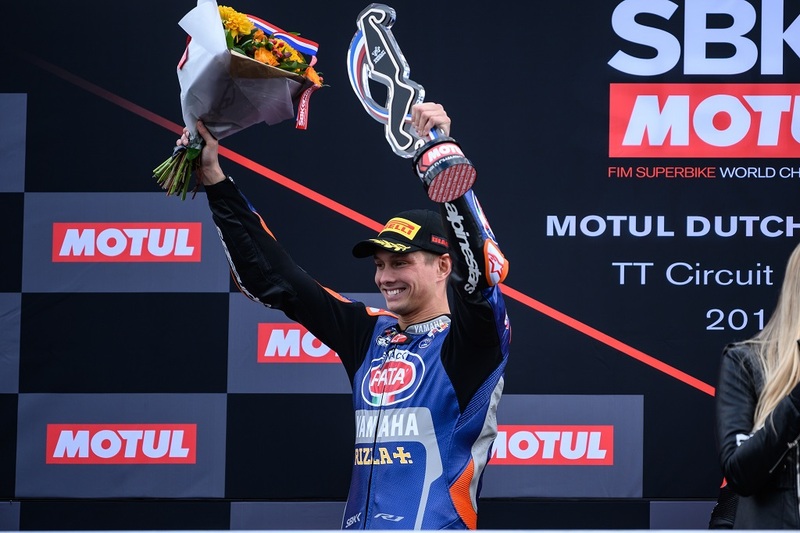 Pata Yamaha WorldSBK rider Michael van der Mark ended his 2019 podium drought emphatically today in Assen, finishing third in the rescheduled WorldSBK Race 1 this morning and then going one better to thrill his home crowd with second place in Race 2 this afternoon. Van der Mark lined up in second position on the grid for WorldSBK Race 1, which was rescheduled at 11.00 this morning after being postponed from yesterday due to adverse weather conditions. The Pata Yamaha rider got a good start but an out of the seat moment in the final chicane at the end of the opening lap dropped him back into the clutches of Jonathan Rea, who passed him for third on the entry to turn one. At half race distance van der Mark caught and passed Markus Reiterberger to secure third place, which he held to the line to claim his first podium finish of the 2019 season. Race 2, held in slightly warmer conditions this afternoon, proved a thriller for the Dutch fans who’d braved the unseasonably cold weather all weekend. While Alvaro Bautista managed to once again pull a gap at the front in the early stages of the race, the battle for the remaining podium positions proved a frantic one. But with a clear track in front of him, Van der Mark set about chasing down Rea. With just three laps to go the Pata Yamaha rider made his move, riding around the outside of the reigning world champion at the kink at Hoge Heide, one of the fastest corners on the track, to take second place. Rea fought back on the final lap, but van der Mark closed the door on his rival and then out dragged him to the line to claim his best result of the season so far. It was cold, but worth it!